Most insurance companies are set up for new customer acquisition. Acquisition is easy to measure. Bonuses are paid for new customers. You can count the new customers on your database. 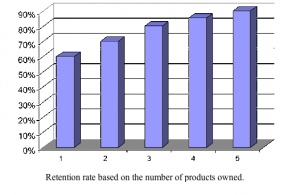 Customer retention is harder to measure. How can you prove that, as a result of your efforts, 42,687 customers did not drop their coverage last year? This is tough to prove, and therefore hard to reward. At the same time, retention can be very cost effective. Many studies have shown that $1 paid towards customer retention increases profits by more than $5 spent on new customer acquisition. What are companies doing about this situation? Sell a second policy to existing customers. Using this knowledge, several companies have launched organized programs to get their agents to sell a second policy by offering customers a discount on their current policy if they buy another product. The most advanced programs use the web as a delivery vehicle to the agents. First, the company uses their database to determine the Next Best Product (NBP) for each customer, based on what they know about the customer, and the typical buying patterns of customers with similar demographics. Next, they figure out the lifetime value (LTV) of each customer now and later if they were to buy the next best product. Let’s assume that the present LTV after five years is $530 and, if they were to buy their NBP would be $930. This means that the company will gain $400 in profit by selling the additional product. From this you can subtract the cost of selling the new product, let’s say $100. If you were to offer the customer a $100 discount on the current product as an inducement, then you would still be $200 ahead in profits. The Next Best Product software scores every customer by propensity to purchase, ranking them in deciles from most likely to least likely. These scores can be used to determine which customers to mail to on a rollout. How to go about selling the second product. Armed with your customer database with Next Best Product calculated and placed in each customer record (along with the saving that you can provide as a premium for the NBP purchase) you set up a web micro-site so that all of your agents can see their existing customers and their next best products. Each agent logs on to your web micro-site and views a list of customers, their NBP and the dollar discount available to them on their current policy. There is a draft direct mail letter to each customer which the agent can view and edit on the web. He can change the customer’s name to a nickname, for example. He can eliminate customers from the list who he knows will not buy the second product. Then he clicks send. To make this work, of course, the biggest difficulty to overcome is to sell the system to the agents. Each agent has their own methods. Some are adverse to using a computer. An organized campaign to sell the program has to be developed and carried out. The other requirement is the need to set up a control group of customers who do not get the letters. Some of them will buy the Next Best Product without any letter, because of various other promotions that are always being conducted. What you have to prove is whether these letters (and the discounts offered) were working. Only by comparing the results with a control group can you prove to management that your money is well spent. One company that conducted a program designed along these lines managed to get more than 80% of the agents in a test area to buy in to the program. The letters worked. Sales of the Next Best Product to those who received the letters were more than ten percent higher than sales to people who did not get the letters. The predictive model worked extremely well. The top decile had a sales rate of almost 70% higher than the average. The follow up phone calls increased the sales rate by more than 40% higher than those who did not get a follow up phone call. Finally, the retention rate of those who purchased a second policy due to the program was more than 6% higher than the rate of those who did not purchase a second policy. Customers want communications. They like to hear from their insurance agents. To be effective, the communication should come from a local agent, not from a national headquarters. A 1% increase in the customer retention rate would be worth millions of dollars in increased annual profits to Travelers. To get this type of increase in retention, the program would have to get 15% of the agents covering 25% of the customers to buy into the plan. What was finally developed was a retention program, built from a customer database that provided a systematic program delivering high quality communications at a very low cost. The messages were from the local agent. The program provided the agents with a turnkey operation which was simple to buy into, and required almost no work on the part of the agents themselves. The program developers learned that for each customer, they had constantly to determine the appropriate message, the frequency of messages that the customer wanted, the desired channel, the timing of the message, and the likelihood of defection. Statistics that showed that 65% of the customers who defected, never talked to an agent before they left. But 80% of the customers who talked to an agent during the year did not leave. The program was based on detailed analysis of the customer database. The program used database data and modeling to determine who was staying and who was leaving. The analysts determined customer profitability and lifetime value. These were used to drive the segmentation and retention strategy. Overall, the program came up with a measurement of customer desirability. Now that the software showed who Travelers wanted to keep, and what they were worth, it was possible to develop and execute a program to modify customer behavior through communications. To get the agents to sign up for the program, it was necessary to make it easy for them. They were sent them a kit describing it. The got an 800 number to call, and were recommended a standard package. They had a Website for them to review the status of their program, and provided regular reports. To sell agents on the program today, the program showed them what happened to agents who bought the program in past years, vs those who did not. Agents who did not participate in the program lost 17.3% of their customers in the first year. Participating agents lost only 12.2%. Numbers like this proved that there was a good return on the agent’s marketing dollar. Why did this program succeed whereas the others had failed? In this programs, the agent was risking his own money. He wanted it to succeed.